Saw Preview: Condemned or Dragon’s Lair? There's something terribly familiar about wandering around a dilapidated insane asylum with crazy people ahead of you and instant-death traps all around you. 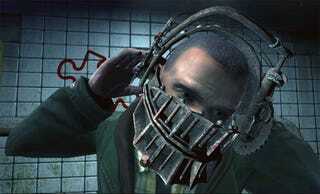 And I'm not just saying that because the Saw video game is based on the Saw movie franchise. Many of the major elements in the game – the setting, hunting down and killing other people – are also the major elements of other survival horror games like Condemned or Manhunt. But the insta-death? I haven't seen something that harsh since the first level of arcade classic Dragon's Lair – where if you didn't duck in the first five seconds, you could kiss all the quarters in your pocket goodbye. Saw is the game that Brash Entertainment was going to publish before they went belly up. It's coming out on PC, PS3, and Xbox 360; and will supposedly fill in a lot of the plot gaps between the two films. Konami's Gamers Night included a massive screening of three minutes' worth of a demo made from pre-alpha code that may not actually be a real level in the final game. Following the presentation, I got to play the full demo on the PS3 which clocked in at six minutes, counting both times I died during the get-the-bear-trap-off-your-head sequence. The demo build was pre-alpha. The game is slated for an October 2009 release. Visual Cues: Like the movie, all the "clues" you need to solve a death puzzle are in the room with you. But thanks to pre-alpha code, not all the necessary visual cues were in place. For example, during the opening bear-trap challenge, there is an icon onscreen that tells the user to rotate the left stick to wind part of the trap. But other other part of the puzzle is subtler – there's a red light on the device that supposedly looks like the B button the 360. But because I was playing on PS3, not only did I not immediately notice the visual cue, but when I did the second time, I pressed X and not Circle, because really – how the hell was I supposed to know which button they meant? Flashbacks: Currently, there is no explanation whatsoever for the parts of the game where you see something like a torture chair and suddenly experience a flashback to someone else getting tortured. Is the main character psychic? Did he actually witness the act and have legitimate memories to flashback to? Right now, it just looks like they desperately want to freak you out and they don't care about continuity to pull it off. Visual Fatigue: I know the game is supposed to be scary, I know the movies are incredibly gory – but if I'm going to slog through 8-10 hours or more of a linear game, I'm going to need a visual break from the visceral horror once in a while or else it will all get stale and headache-inducing. Think Fast! : If they nail the visual cues thing, I don't actually have a problem with the insta-death. For example, part of the demo involves going through a booby-trapped door. You've already been warned about it (because they want you to finish the demo, not fling cans of soda at it), but not explicitly told how to deal with it. Because I'm a natural pansy, I got it on the first go by opening the door and not immediately mashing forward on the analog stick. By just standing there, I had plenty of time to watch the pulley part of the trap go upwards – spotting the big Triangle button in time to actually press the button and avert the shotgun blast to the head. The Element of Surprise: I don't know that a game couldn't really stay scary if you had to go through the same insta-death puzzles over and over again; but a developer John Williams told me in an interview that many of the puzzles in the game are randomly generated at each encounter and that some of death traps actually won't be instant. For example, the shotgun-rigged door won't always kill you – just royally mess you up once in a while. Little uncertainties like these make the game that much more interesting than your average movie licensed game. I'm on the fence about the other people in the asylum with your character. Over and over again during the demo, the developer (and villain Jigsaw) stress that you shouldn't trust anyone and that there will be characters throughout the game that are either trying to kill you, manipulate you or beg you for help to kill someone else. This dynamic could be interesting – if there were someone you really want to help. If not and you should trust no one, it'll get a little boring when the next horribly maimed person runs away from you in a darkened, blood-stained corridor. But, if we see more movie games striving to be more like other games such as Condemned or Manhunt instead of trying to be entirely faithful to the movie, I call that a win and salute Saw.